Well after years of sitting on these puppies I have finally gotten around to fitting them.The fit is very nice indeed. The original cam retaining bush which had almost zero wear at 42,000 klms which was a surprise. The updated cam retaining bush. 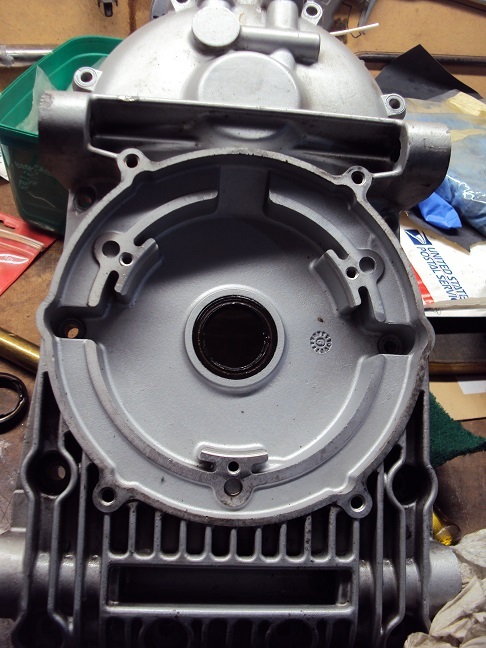 Note the oil feed reliefs machined into the front face to improve lubrication. I had one of the new ones on hand but otherwise I would have just die ground the reliefs. The Lucky Phil cam/crank holding tool.Being the lazy type I made this up with very low expectations but it worked a treat. Just goes to show sometimes you can overthink things and simple is best. Leverage is your friend...sometimes. Gears installed and ready to button up. 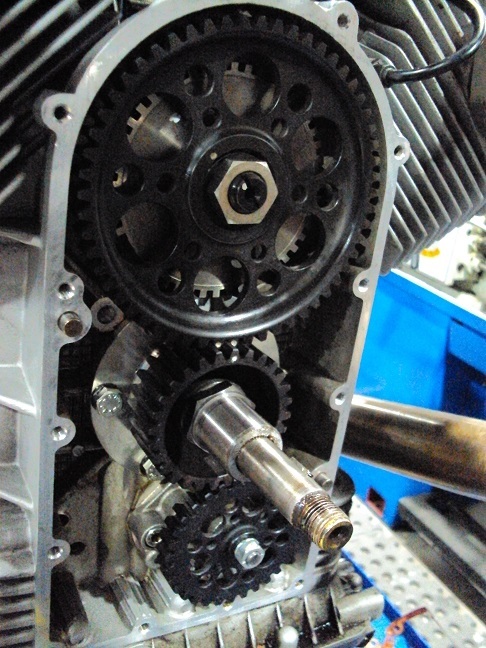 New crank seal installed. Be silly not to. Gears were greased lightly for the first start. 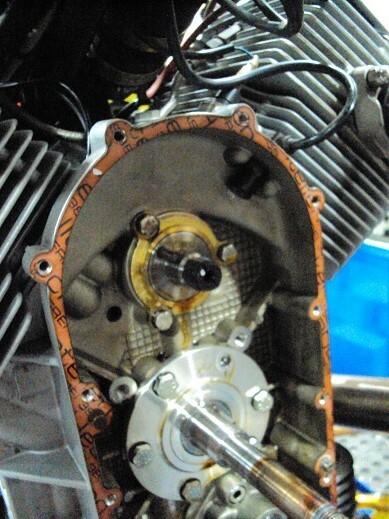 I pulled the ignition pickup and put 500ml of oil in there so the gears have some lube for the first start. 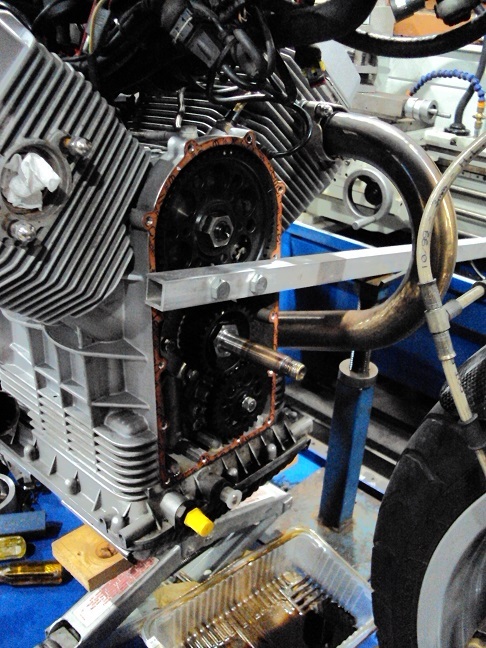 This area of the crankcase only gets the oil from the front main bearing and cam bearing leakage plus any that might slosh forward under braking from the sump. 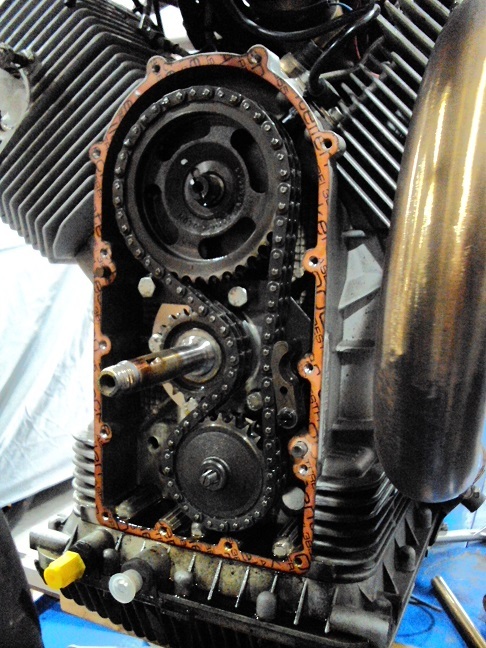 So the gears rely on the oil pump gear picking up trapped oil in the bottom and flinging it up the gear train and crankcase vent oil and main/cam bearing overflow. Hence filling the well so to speak. 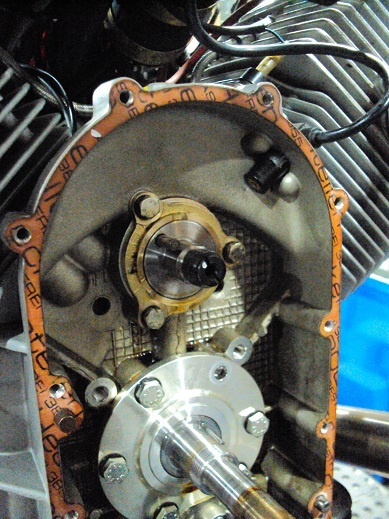 A new metal timing cover gasket also installed. Now to replace the manual fuel tap that decided not to shutoff when I was pulling the tank. Faulty somehow. Not very safe to have liters of fuel pouring out the fuel tap with the tank halfway off and not able to be dropped down again so the fuel hose can be connected. After that its the gearbox support plate to install. Back to V7 Sport design of 1972. Are these gears steel , aluminum or what ? Not quite, these are straight cut not helical and about twice as beautiful and I suspect the same multiple quality wise. I have two sets, one for the wife's V11 and one for my Daytona, sitting on the shelf waiting for me to find the time to install them. So, I am interested and would love to see more pictures. Maybe it will motivate me, although our basement flooded and now the garage is full of cr@p from the basement so I don't really have the room to do the work. But still interested. Don't forget to let us all know when you finally put them on Ebay. Images added to original post. 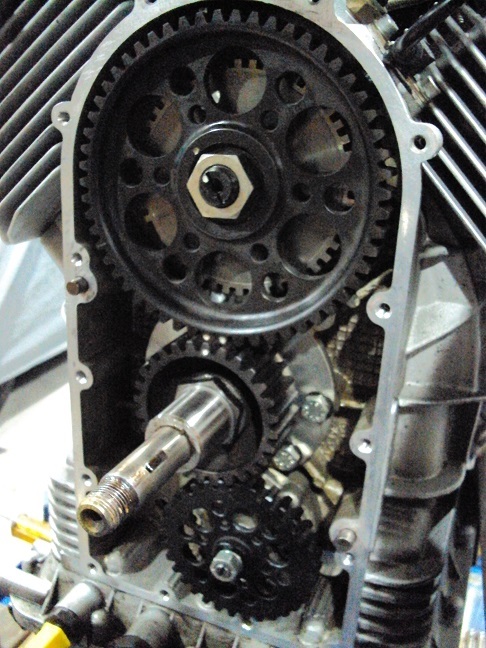 I am sorry but if the motorcycle that these gears are placed in is for a street bike I have to ask why? I have to ask as I have never found a good reason to run a straight cut gear set on anything street driven. And very seldom for anything for racing. Hey, buddy.. that got a blower on it?? Elegance, engineering purity? You may as well ask Ducati why they bothered with that lovely bevel drive system on their old twins, or their continued adoption of Desmo valve gear or MV Agusta on why they bothered with silly gear driven cams on their road and race bikes or Honda on their VFR series or Rolls Royce for using shaft driven bevel gears on a Merlin engine.